Our Community's Innovation Lab is where we seed ideas to do old things better or new things first. Our founding aim in 2000 was to build stronger communities through stronger community organisations. We have done this by creating useful online tools and capacity building education and training at a price even the smallest not-for-profit groups can afford. We've also worked to keep the money moving, creating smarter grantmaking methods and tools, and a commission-free online donations platform. Billions of dollars are now moving into the not-for-profit sector more efficiently through our grants administration tool (SmartyGrants), while more than $12 million per year is flowing from individual donations to good causes through GiveNow. By forging partnerships with business, government and philanthropy we've accelerated our impact and increased our reach beyond our home zone of Australia. We're now servicing grantmakers in 32 countries around the world. Now there is a new currency that is powering social reform. Data is reshaping our world. New tools allow us to collect, distil, understand and act on data like never before, hastening the pace of change. We want to make sure the social sector can grasp the possibilities presented by these new tools. Below we have outlined some of the key initiatives that Our Community will use to propel the social sector into a new data era, and the values that underpin this work. Following the completion of the first Our Community House Data and Communications Lab project, the team reflects on the lessons learned, and outline their new ways of working which facilitate collaboration with not-for-profit organisations. To examine donor preferences by gender, we analysed all donations made through GiveNow, one of Australia's leading donation platforms, from March 2001 to August 2016, grouping all donations by the category of the cause they were made to. We then charted the ratios of men:women and recurring:one-off donations in an interactive visualisation. Following a recent inquiry by ABC News Northern Territory, we investigated (1) whether or not the average GiveNow donation value in the NT was not just larger, but also statistically significantly larger than the average donation in other states, and (2) the underlying reasons for the apparent generosity of NT donors. We are developing an algorithm to reduce or remove the need for manual (human) classification. Once released, CLASSIEfier will allow us to classify historical records on behalf of grantmakers and other social sector supporters. In this white paper, we explore how suggested donations influence giving, and how not-for-profit causes can increase their giving by altering these suggested amounts. Our Community is doing its bit to "grow the pot of gold under the rainbow", crunching the data to help improve the flow of funds to lesbian, gay, bisexual, transgender, queer, intersex (LGBTQIA+) groups. This data science project combines two of our passions: grants and gender equity. We set out to find out whether an applicant's gender would affect the result of their application for funds. Having built a system designed to make grantmakers more efficient, we now want to help you become more effective. Our "Outcomes Engine" will use modern data analytics, data visualisation and impact evaluation concepts and tools to help you analyse your funding patterns, compare them with your objectives, and track your progress towards your aims. Galaxy formation? That's nothing. Try understanding the impact of grants. Dr Paola Oliva-Altamirano, an astrophysicist, astronomer, and specialist in the creation of galaxies over billions of years, has turned her attention to something harder - data science for the social sector. This whitepaper explores a concrete example of a trade-off that can occur when developing a grantmaking algorithm. It is written for grantmakers, grantseekers and anyone else with an interest in grantmaking algorithms. Late last year, Our Community released a new version of CLASSIE, the data classification system that underpins an exciting array of data analytics projects. The newest release of CLASSIE (Version 2.1), now available in the SmartyGrants online grants management system, incorporates feedback received by grantmakers and others since November 2016. 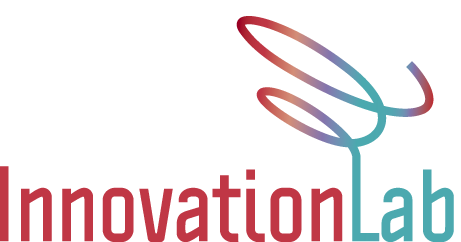 Our Innovation Lab is looking for opportunities to collaborate with other social-change organisations on a data science project. The organisation whose idea is selected will get the benefit of free data science knowledge and expertise. The project will help Our Community to understand the types of data problems our members have, and exercise our team's skills in solving them. New research undertaken exclusively by Our Community's Innovation Lab shows ICT expertise on not-for-profit boards is failing to keep pace with the digital world. There's a new currency powering social reform - data is reshaping our world. Here's what Our Community is doing to make sure the social sector doesn't miss out on grasping the possibilities presented by these new tools. The Grants in Australia Survey is the biggest research program of its kind. In 2017 we set our data scientist loose on the 1200 responses from the latest survey, as well as data from all previous years. The result is a report that digs deeper and offers more insights into grantmaking in Australia than ever before. The work of Our Community's Innovation Lab is guided by the principles outlined below, as well as the Our Community group's Manifesto. Data is valuable. Data should be seen as a community resource that can be used to inform decision-making and thereby create social good. People matter. Data without context, expertise and people-centred values is worse than useless. Data should support and inform decisions; not dictate them. Useful beats interesting. Every time. Data should serve an agenda. Start with the questions, not the data. Stories count. Numbers need words; words need numbers. There is almost always a place for both. Learning is better than punishing. Transparency and accountability should be driven by a desire to inform and progress, not shame, reprimand and punish. As open as you like. We balance our enthusiasm for open data with our belief in an organisation's right to learn in private. Access is imperative. Small organisations can create big impacts if they have access to the right knowledge and tools. Giving good organisations with small budgets access to data resources creates opportunities that can be reaped by society as a whole. To scale, it must be simple. We have a responsibility to create tools that are simple enough for anyone to use. Decisions need to be explainable. Black-box algorithms are risky. We need to be able to explain the rationale, strengths, weaknesses and future behaviour of our models. Data literacy is fundamental. Basic data language and concepts need to be understood by all people, regardless of age, sector and role. None of us is as smart as all of us. Individuals and organisations that work in silos limit their progress and are doomed to repeat the mistakes of the past. We look for opportunities around the world to collaborate and share what works. Sector-based silos need to come down. Not-for-profits do not have a monopoly on creating social good. If your intentions are sound, you're on the team. Change is inevitable. Let's make it as painless as possible. We embrace change where it signals progress. We strive to gain and keep the confidence of our stakeholders by articulating and living out our data principles. We hold ourselves to high standards but never seek to hide our human frailties. If we make a mistake, we'll acknowledge it, and work to ensure it doesn't happen again. We adhere to the highest standards of data governance, particularly when it comes to personal data. We treat your data as we expect others to treat our own. Speed matters. Deferring action is not an option. Ready, fire, aim. CLASSIE is a landmark initiative that enables systematic classification of Australian social sector initiatives and entities - an Australian social change dictionary. Using the US Foundation Center's well-respected and recently revised taxonomy as the spine of the system, the taxonomy draws on a well of knowledge contributed by a voluntary team of more than 50 subject matter experts. CLASSIE (Classification of Social Sector Initiatives and Entities) is used to create consistency across Our Community platforms - without consistency, global insights are very difficult to extract. Developing a common language helps us join the dots and derive insights that cut across a range of government, business and community activities. Our Community's CLASSIEfier project involves applying data science to the task of auto-classifying written records (e.g. grant applications, appeal descriptions, mission statements). This allows us to classify past records instantly, reveal funding patterns and create benchmarking insights. In order to create meaningful and sustained change, the hard-won knowledge and experience of not-for-profit organisations must be respected and harnessed. Data science is the new currency that is powering social reform. New tools allow us to collect, distil, understand and act on data like never before, hastening the pace of change. The Our Community House Data and Communications Lab will ensure the social sector can grasp the possibilities presented by these new tools, trialling and refining new methods for managing and learning from data, and disseminating the tools and lessons to the wider social sector to amplify its impact. The OC House Data & Communications Lab is supported by Equity Trustees, with thanks to the Ella & Mitchell Brazier Fund, Charles Lamond Forrest Estate, James Raymond Hartley Charitable Trust, Charles Frederick William Taylor Estate and Truby & Florence Williams Charitable Trust. > See what's happening at the Our Community House Data and Communications Lab. We want to make it easier for community groups to recruit, raise funds, fast-track grant applications and manage all of their information in one place. Project Streamline centralises and systematises the storage and retrieval of reusable information about social sector organisations. A central repository will be linked with Our Community's numerous online systems (including SmartyGrants, GiveNow and the Join In, Join Up! directory), making uploading and updating of data into online appeals, grant applications and a range of other services and platforms instant and effortless. Project Streamline also lays the groundwork for the creation of networking, benchmarking and governance/oversight tools that can help social sector organisations identify allies and collaborators, compare themselves with other organisations in their field or of their type, and super-charge their performance. Millions of hours and billions of donors are flowing into the social sector each year - to what end? We want to know what changes are being created, as well as learning how we can replicate the good changes and avoid the bad ones. We're working on the creation of a universal Outcomes Classification (part of CLASSIE) that can be used to help us collect and categorise information about what changes are being sought, and how those initiatives are panning out. In addition, we're working on systems that can be embedded into our platforms (our "Outcomes Engine") that will help generate better-designed, better-interrogated, better-understood social-change initiatives. Importantly, we want to showcase what is learned along the way to anyone and everyone working towards the same aim. The Centre for What Works will reveal insights about what activities and outputs seem to lead to particular outcomes, while the Plans and Tools Bank will provide a knowledge base of templates and tools associated with interventions that work. Our 'What Works' initiatives will help our partners close the design > deliver > evaluate > design loop. Machines can't do everything, but they can do a lot of things. It's a brave new world, but we're getting started. Our first major step into this arena is an investigation of how algorithms and artificial intelligence can be used to eliminate bias and speed up grant application assessments. We're also looking for ways to assist grantwriters to draft and check their applications, to improve the quality of applications submitted. Next up is an online donations experience that's tailor-made for the user. In our artificial intelligence projects, we always aim to build explainable models. We avoid black-box algorithms (opaque systems of decision-making) as much as possible, focusing instead on methods that allow us to quantify the 'why' in the prediction. Why did our method lead to this decision? What are the strengths and weaknesses of the algorithm? Are we propagating existing biases in the data, or eliminating them? How will our model behave in the future? We believe these questions are imperative, and more important than a 0.1% more accurate model. We support transparency in the social sector, particularly when it comes to knowing and showing where the money is going, and the effect that money is having in creating social change. There is an increasing level of interest in open datasets, as well as new regulations that seek to apply transparency to the work of government. We want to help platform users open up their data and provide them with tools to help navigate it. Work is under way to adopt an open data standard for grants information in SmartyGrants, and provide a one-click tool to allow willing grantmakers users to export what they want to where they want it. We have an in-house data science team and a number of initiatives planned and in progress to interrogate the data we oversee. Our outputs in this arena are underpinned by our "useful trumps interesting" mantra, driving us to ensure that any findings we arrive at have real-world applications. Some samples of our outputs are outlined below. In 2016 we conducted an in-depth review of donation data in our GiveNow platform and launched 'Who Gives? ', a ground-breaking report that can be used by community groups to inform their fundraising strategies. The analysis of more than half a million donations over 15 years allowed us to uncover emerging trends in donation patterns, as well as sector-specific and gender-specific donation patterns that not-for-profits can use to tailor their approach. In mid-2017, we launched dashboard functionality in SmartyGrants (our grants administration software) to deliver instant insights to grantmakers and help them visualise their data. Dashboard widgets encourage grantmakers to think more strategically about how they administer their programs and interrogate more carefully their funding patterns. Our yearly Grants in Australia report combines the data analysis prowess of our data scientist with the deep grantmaking domain knowledge of our team, allowing us to chart historical trends and create practical takeaways for grantmakers. 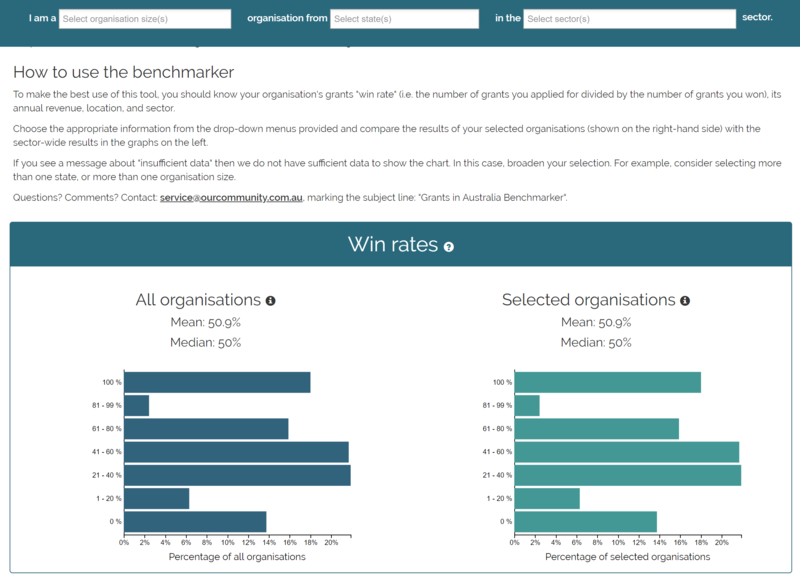 The survey has also enabled us to develop a useful benchmarking tool for grantseekers, allowing them to compare themselves to organisations by size, sector and state (see example to the right). To access the the benchmarking tool, you must be a member of the Funding Centre. We've built SmartyGrants Maps to help grantmakers analyse their activities and improve their practices. SmartyGrants users can see where grant funds were requested, where they were allocated, and to help identify areas that have been overlooked. We use data analysis as input into our feature design. For example, we use techniques such as A/B testing to better understand user behaviour and to assess what options are the most appealing/effective. Can you influence donor decisions about what amount to give to a particular cause? Our A/B tests are providing some deep insights. We're creating a range of tools to help grantmakers and grant recipients uncover and remove biases, creating fairer, more effective social change. In our first initiative we worked with the Australian Women Donors Network to create greater gender awareness in the awarding of grants. Gender-wise grantmaking occurs when grantees are encouraged to consider the social disadvantage women and girls face when designing and delivering grants-funded projects and programs, and where grantmakers themselves consider gender when setting and reviewing funding priorities. This work included research into ways in which organisations can apply a gender lens to their work. Awareness-raising is never enough for us. We want to create the tools that will turn awareness into action. Three new Gender Lens standard fields were introduced to SmartyGrants in November 2016. We are monitoring the use of these fields as part of our efforts to ensure this important work can stick and spread. Read more about our gender-lens work with grantmakers. We are mindful of our obligations to provide proper stewardship and safeguards over the data that's in our keeping. Data ownership, privacy and confidentiality are top of mind as we navigate the new era. Our data reference group provides input into our decisions as we transition our policies and practices, nut out answers to some of the more difficult questions around access and security, and help gauge how our user base might respond. Our policies and practices are designed to support our ambitious agenda, while maintaining our hard-won position of trust. Contact us by emailing service@ourcommunity.com.au.